PDF-XChange Editor can be used to create PDF files from scanned documents, images, text files, Markdown files and much more. This software can also be used to convert Microsoft Office documents into PDF** – a feature that many PDF applications do not offer. There are over a hundred features available, including more than thirty tools that can be used to assist in the creation of document comments, annotations and links. These tools make editing PDFs a finely-tuned, precision process that produces documentation and image files of the highest quality. Our user-friendly functionality is diverse enough to meet the needs of all practitioners from novices to professionals. Export from PDF to MSWord, Excel, & Powerpoint. PDF-XChange Editor is licensed per user, so if more people are going to use PDF-XChange Editor you will need to purchase additional copies. Gary Smith The Fine Print states "You can install/register the software at any time," so when does the countdown for the license start? When it is purchased or when the program is installed and activated? Gary Smith The Tracker Update program can be used to find out if there are any updates/upgrades later than what the user has installed. Does the Tracker Update program lists updates that the user can legally use to update their program (without paying a fee) or does it list any and all updates, even those that the user would have to pay for if they install them? Your maintenance plan will start from the date of purchase. The updater will hide any updates that are not covered by your maintenance plan. You can opt in to show the hidden updates from the Updater. Drag and Drop over Windows Explorer is supported. Unfortunately Directory Opus works in quite a different way, so support for it has to be developed separately. Ben User Hi, do you plan on offering PDF-XChange PRO any time soon? I'd like to get that instead of just the editor if it's coming soon. Ben User Also, how much does renewal cost after the first year expires? I see offering for two year and three year maintenance, but how do they compare in price? Scott Youngman This is really excellent PDF software. I have been using the free version for years, and am glad to move up to the paid version with this offer. Will we be able to add the 2- or 3-year upgrade option when we purchase? I hope you will fix a long-standing issue: After switching away to another application and back to PDF-Xchange, the previously active tab is no longer active so the user must click on it to reestablish focus. Wish: The active tab will be focused after switching away and back to PDF. Thanks. No plans currently to offer the Editor Plus on a similar offer. The upgrade from Editor to Editor Plus for a Single user license is $11.45 USD / €9.87 EUR - or roughly the difference between the full prices of the two products. Yes you can add the extra maintenance options during the checkout! Ben User Hi John, I meant the PDF-XChange PRO that includes the Editor Plus, the PDF Toolkit, and the PDF-XChange Standard printer. But from your answer I guess not. On a side note, any of you know how to snap in XChange? Besides the measurement tool I can't really align or snap text box or objects. SoftCollector What exactly are the differences between the different versions of the product: Free-Standard-Pro-Tools, etc. ? Could not find a simple comparison chart on your site. Yes the PDF-XChange Pro bundle will be promo'd on Bits du Jour later this month. So keep watch for it as we usually only run promotions on our software once a year and through BDJ. The comparison chart shows what features are included with each license, since the product licenses include other component products like PDF-Tools includes the Editor and Lite printer it therefore includes all of the features of the primary product (license name) plus the features of the component products included with that license. Ben User Darn it John, I made the purchase for the editor already. Anyway to arrange a deal when the PRO bundle comes on Bitsdujour? Since we don't often discount our prices, we would have hoped that you waited for our answer to your specific question prior to purchasing. It would have not been appropriate as well for us not disclose that a Pro bundle promo was in the works as customers would have found out through BDJ in the next couple weeks. If you log into your account on our site created with your purchase and click the upgrade options tab, a discounted upgrade to the PDF-XChange Pro is available there. Best we can do. Ben User Well, I guess my hands got ahead of myself. I'll make another purchase of PRO when it comes and have my family use the Editor license I've purchased. Thank you for you help John. Constantin Florea @Cary Adams, I am sorry about the issue. I just updated it to the latest version. Rob Just another thumbs up for this software. I've been using PDF-XChange PRO for a couple of years and can't speak highly enough of it. I tried lots of PDF editors and this was the best of all of them. The OCR is just magic and pretty much gets it right first time and the commenting and markup is very comprehensive. In the PRO version there's so many features I probably will never use all of them but it certainly has every feature I could have wished for. Thanks for all the kind words, we're happy to hear you're such a fan of the software. Cheers! Sara User I had been interested in this program some years ago, then quickly gave up since I wasn't able to grasp how the different versions differed, let alone why they did that way. Since now, years later, the same observations came, from other prospects, I tried again to grasp to understand to what clearly distinct use cases those versions target, and again I failed, I simply cannot memorize all those various limitations in order to get a clear picture, since here it's not straight, free-standard-pro, but mixed up, and since the same complaints have always come from others, over the years, it's safe to assume the developer wants it to be like that. Harlen Wiebe I've been using the Pro version for several years. I liked it so well we've purchased it for all the computers in our office. Custom settings can be copied to any or all computers, can drag n drop pages from one open pdf file to another, really good password protected signatures, and great support. Adolphe @ Sara : I agree about the utter confusion of the XChange product line. I'm one of the users who mentioned it to them years ago, and they didn't change a thing. This is my pdf reader of choice, and their products have many, many qualities, but it's almost as if they wanted to discourage prospects from choosing one of their programs. And no, I don't think it's a marketing ploy. It's a mistake. One that probably stems from the history of their product, and which they refuse to correct now, because it would indeed be tricky for them to disentangle all those similar, and vastly overlapping products. The neglect is obvious, though, when you consider how stubbornly they cling to the one mistake which would be very easy to correct : change the name of PDF-XChange Lite and PDF-XChange Standard. Contrary to what their names suggest, those programs are not pdf readers, nor pdf editors, they are pdf virtual printers. So, an entirely different type of beast, separate from the rest. The obvious decision would be to rename them as PDF-XChange Print, or something similar, and then they could have PDF-XChange Print Lite, Free, Standard, Professional or whatever. That would be a no-brainer, with zero commercial risk. But no, they want to keep us guessing. I maintain detailed notes on their product line, in order to understand what they are up to. It would be impossible otherwise. Cary Adams A few years ago I bought NitroPro because PDF X-Change was incomprehensible. And largely it still is today. What needs to be done is to feature increment the various products with clear satements of the added features as you go up progressively in price. 2. Drop including features not available w/o upgrading (for example no OCR or From menu/buttons in Std. FWIW I tried the "Pro" trial yesterday and don't understand why Tools and Standard were installed as a separate product. I should be able to do everything through the Pro interface. Allows you to Print to PDF creating fully compatible, text searchable PDF files. Both product icons are that of a printer. We understand we can't please all of the people all of the time, but this is a simple promotion for a simple product offering and we hope that if you like the product that you will be pleased with the sale as we rarely discount or our products. Scott Youngman While granting that the overlap among Tracker products can be confusing, the choice is actually not difficult if your need is for basic yet highly capable PDF software: PDF-XC Editor (the product in this BdJ offer) is more than sufficient for most user's needs. For myself, that's primarily for PDF viewing, annotating, printing, converting, and manipulating (e.g. add, delete, or move pages, split or merge files, etc.). Those with more demanding use-cases can choose from Tracker's other products -- perhaps in consultation with their support staff (as John Verbeeten suggests). 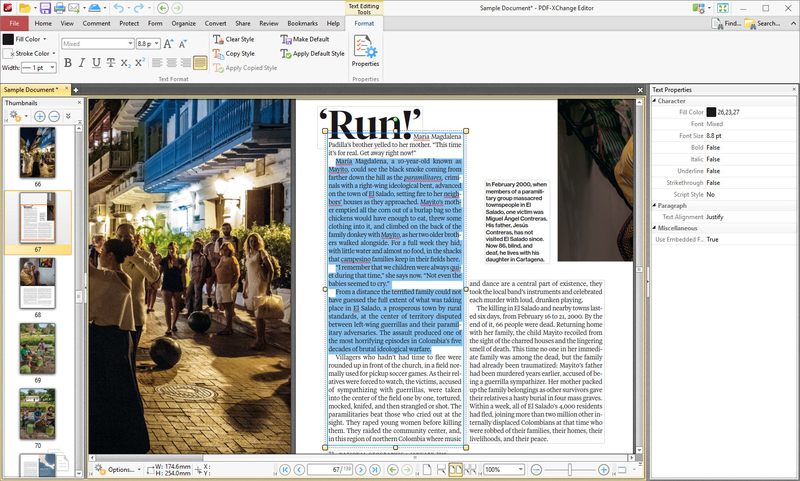 I have tried many PDF apps over the years, and PDF-XC Editor (even in its free version) is clearly superior to all of them in features, ease-of-use, and reliability. Its regular list price is a bargain compared to other commercial PDF software, so this generous BdJ offer is an excellent opportunity if you often work with PDF files. I'll be purchasing my license as soon as I post this. Farhang @John Verbeeten: I have purchased a couple of Tracker's products over the years and I use pdf files all day long. I also own licenses for Acrobat, Nitro but heavily use Tracker daily. You have truly a very competitive product and many power users are fans of your editor. I also understand your position and you are right that you "cannot please all of the people all of the time." It's certainly understandable that you are frustrated and there is nothing to do for this promotion. But, as an actual customer of yours since 2013, I agree with the above comments. Despite owning and using Tracker products, I too find the charts and the nomenclature convoluted. The end-user page has 6 products; the chart has 5. Perhaps my favorite product from Tracker was the Pdf-Tools. I happily paid for minor upgrades but I am not going to upgrade it to the current that is now bundled with the editor and the free printer. My very old version that takes 11mb on the disk and does a great job to this day. John Verbeeten My comments on product confusion were not meant to be dismissive and we always take customer input as valid and take it seriously. We understand the product line over time has been a little confusing for some. And all who've posted here on this topic, upon receiving the feedback here, it was quite extensively discussed at our interdepartmental meeting this morning. And further efforts will be made to help provide clarification on the line, that may include some reconfiguration. Everyone's comments here today have been taken note of and has started that conversation internally among all depts involved. And all feedback is appreciated and valued. Thank you ALL soooo very much for your comments !!! I am a customer (bought one of their products some time ago). There are threads on BdJ, just abt which product is which & does what. Most threads are filled w confusion abt the different products, instead of comments pertaining to the product itself !!! This should have been a clue quite some time ago, but ... the confusion persists. I suppose the cie does know what is what, it's clear to them. We DO like their products, we DO like to use them, we DO like the cie, but darn they do make it difficult for us to buy them. What Adolphe said above abt the renaming is quite SMART !!! I actually now know which product I need to get. SoftCollector I read through the comparison table and still have no idea what each of these products does. Having two versions: Standard and Pro is what competitors usually adopt as a winning strategy. Just my 2 cents. franp User My two cents ... I must admit that while the product line is OK for me, the products NAMES are about the most confusing I ever see anywhere (apart maybe French government offices ...). - PDF-XChange pro should be rename for what it is, namely PDF-XChange Editor Pro.